Kate Spade always has the most darling handbags and statement clutches seen around town. Its the perfect way to start a conversation with someone or send a message to a special someone who needs a little push in the right direction. So this week's bag of the week is dedicated to Kate Spade Mimi's for the holiday season. December is the ideal month to either get engaged, married or simply attend those holiday parties everyone will be talking about. So what better way to make a grand entrance than with a Kate Spade Mimi ensemble on your shoulder. The details in the Black and Rosy Dawn Evening Belles Feather Mimi feature 14 karat light gold plated hardware, silk satin with feathers and custom woven cocktail party jacquard lining. Now accessorize these feather mimi's with a LBD to glam your night but most importantly, don't forget to take a selfie. It won't be a night to remember unless its on Instagram. Now how clever is this Wedding Belle License Plate clutch with patented leather trim and handheld frame clasp closure. 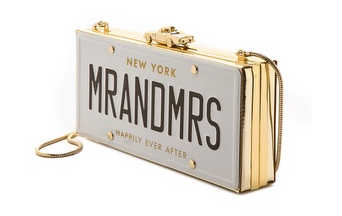 Nothing says "I Do" like a clutch to wish you and your husband Happily Ever After on your big day. Kate Spade sure know how to bring love into the air with this clever clutch and I adore the fact that its a license plate to be seen and worn for every special occasion you attend with your man. Yes, these mimi's have holiday spirit written all over them. They're definitely must haves for the holiday season especially for the parties. I hope you enjoyed my post and thanks for stopping by. This clutch is one of my favorites that I've seen by Kate Spade. It definitely makes a strong statement! I'm glad you like them. These Mimi's are so fancy!